Scientists have yet to understand and explain how life's informational molecules – proteins and DNA and RNA – arose from simpler chemicals when life on earth emerged some four billion years ago. Now a research team from the Stony Brook University Laufer Center for Physical and Quantitative Biology and the Lawrence Berkeley National Laboratory believe they have the answer. They developed a computational model explaining how certain molecules fold and bind together to grow longer and more complex, leading from simple chemicals to primitive biological molecules. The findings are reported early online in PNAS . Previously scientists learned that the early earth likely contained the basic chemical building blocks, and sustained spontaneous chemical reactions that could string together short chains of chemical units. But it has remained a mystery what actions could then prompt short chemical polymer chains to develop into much longer chains that can encode useful protein information. The new computational model may help explain that gap in the evolution of chemistry into biology. 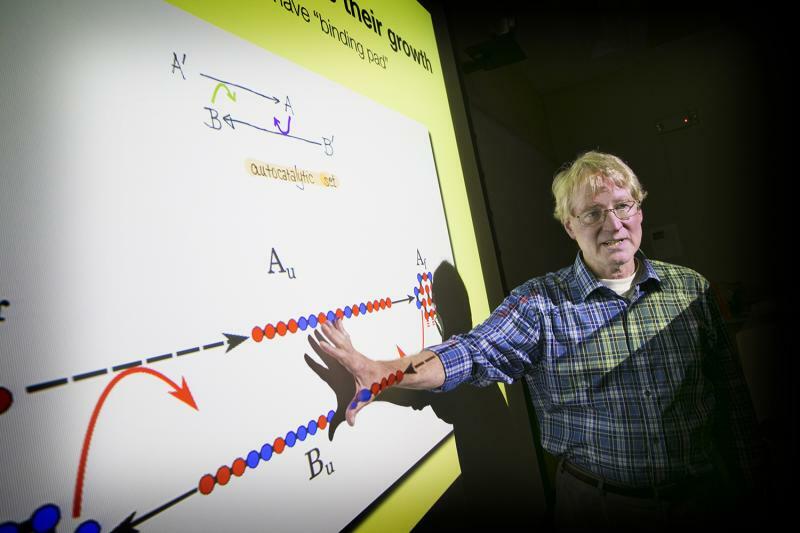 "We created a computational model that illustrates a fold-and-catalyze mechanism that amplifies polymer sequences and leads to runaway improvements in the polymers," said Ken Dill, lead author, Distinguished Professor and Director of the Laufer Center. "The theoretical study helps to understand a missing link in the evolution of chemistry into biology and how a population of molecular building blocks could, over time, result in the emergence of catalytic sequences essential to biological life." In the paper, titled "The Foldamer Hypothesis for the growth and sequence-differentiation of prebiotic polymers," the researchers used computer simulations to study how random sequences of water-loving, or polar, and water-averse, or hydrophobic, polymers fold and bind together. 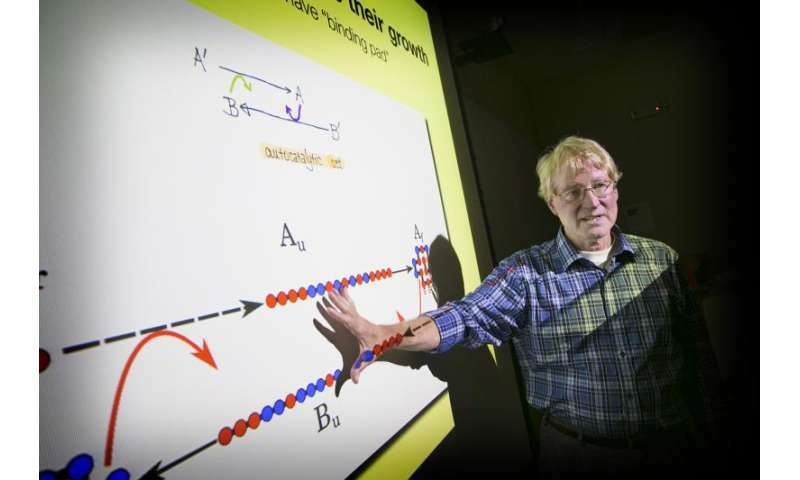 They found these random sequence chains of both types of polymers can collapse and fold into specific compact conformations that expose hydrophobic surfaces, thus serving as catalysts for elongating other polymers. These particular polymer chains, referred to as "foldamer" catalysts, can work together in pairs to grow longer and develop more informational sequences. This process, according to the authors, provides a basis to explain how random chemical processes could have resulted in protein-like precursors to biological life. It gives a testable hypothesis about early prebiotic polymers and their evolution. "By showing how prebiotic polymers could have become informational 'foldamers', we hope to have revealed a key step to understanding just how life started to form on earth billions of years ago," explained Professor Dill.